manofthematch wrote: Sorted. The parentals are hopping over to the US so I've ordered one and will have it in a couple of weeks. manofthematch wrote: Surely now I am GAS free. It seems very complicate but very simple to setup. Last edited by Cleric on Thu Sep 18, 2014 10:58 am, edited 1 time in total. Gosh, how do you remember which pedal to push for which effect. Impressive! What styles of music do you play? 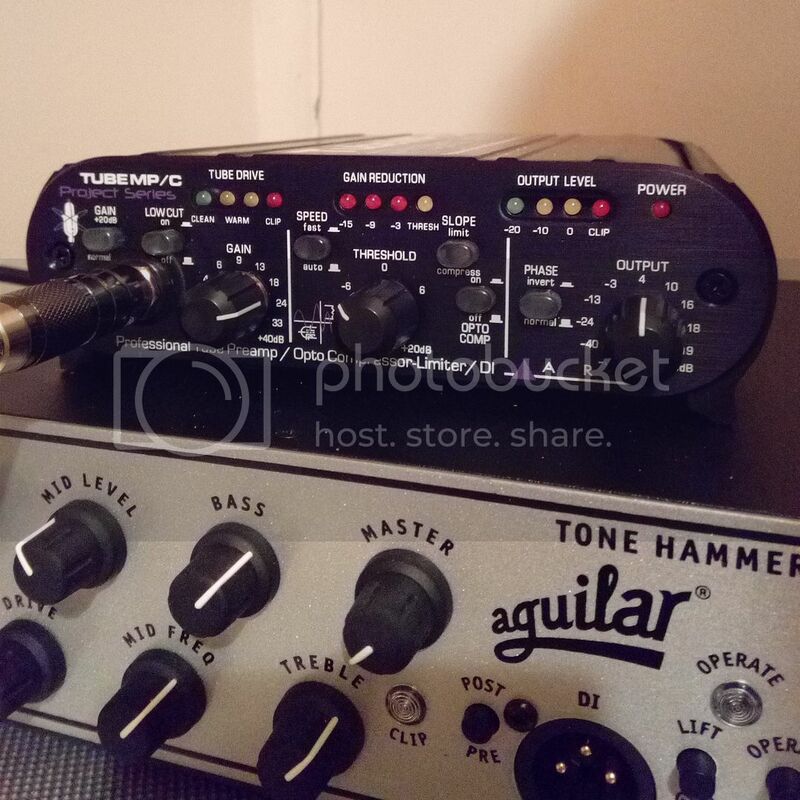 Is the tone hammer the preamp the the tone hammer amps? greghr wrote: Gosh, how do you remember which pedal to push for which effect. Impressive! What styles of music do you play? HI Greghr, i normally turn on the compressor, sonic stomp and tone hammer then i switch between chain A and B depends on what songs i'm playing with. My music genres are various but i usually play RUSH songs! john wrote: Very nice, Cleric. Here's my lovely bunch of squawk boxes. Just need to add a Line 6 G30 or G50 and maybe a fuzz box. New tube pre/compressor day!!! Well two days ago and it's not really a pedal but I wasn't sure where to put this and it doesn't warrant it's own thread. I was in the market for a compressor pedal to take care of the odd rogue note and I saw that these were $70 off on sale so I went and tried it out. I'm pretty happy I did because not only does the compressor do what I want and I can visually see what's going on but the tube pre warms and fattens out the sound a bit too, which is nice. john wrote: New tube pre/compressor day!!! Well two days ago and it's not really a pedal but I wasn't sure where to put this and it doesn't warrant it's own thread. nice! now with everything already 'light weight' and portable... try not to get tempted into putting everything in a rack unit! Been a few years since I posted my last version of the main rig. Has changed a bit over the years. That's quite a pedalboard! The two wireless units are presumably so you can run two basses and the red pedal switches between them? What is the silver/white pedal in the front row with the red demon picture on it? Yes, I have two wireless units for two basses with the pink A/B switch (made by Peper's Pedals in Dunedin) to toggle between them. At the other end is the VT Bass Deluxe which I use as a two channel Preamp, with bank A set up fro one bass and B set for the other. At the moment A is EQ'd for a passive Precision and B is EQ'd for an active bass (my Stingray or Jaguar). 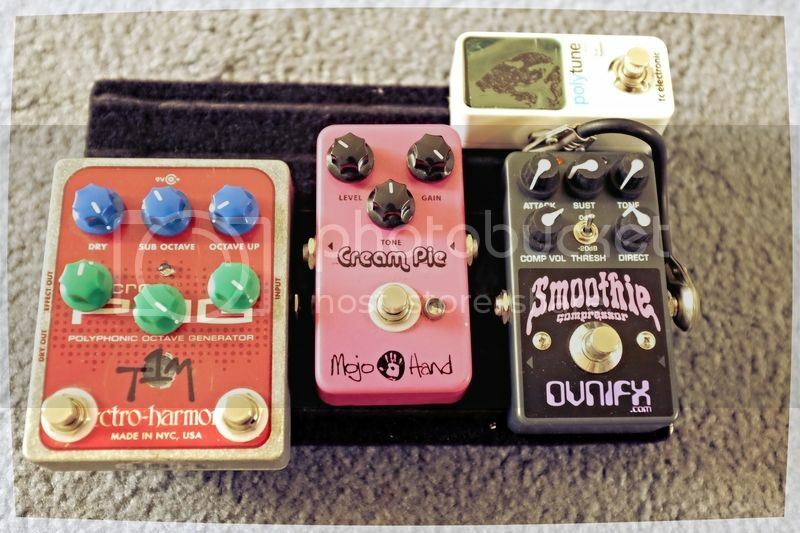 The White pedal you are asking about at the bottom is the most recent addition. It's a delay pedal made my Bush FX in Auckland. Ben is an amazingly talented kid (he's still at school I believe). It's a fantastic delay unit (a clone of something expensive) with controls over repeats, level and just about every parameter you could want from a delay. He can do pretty much any pedal. He uses a few of his own graphics on the enclosures but for a scant $5 more he can put whatever you like on there. Being a fan of Futurama, I thought Robot Devil would be cool and sent him the pic and without instruction or request he even added a second LED so both eyes light up when the unit is engaged. haha. I got the Tech21 Chorus as well sort of getting used to it.